Ven. Bhikkhu Buddharakkhita was born and raised in Uganda, Africa. He first encountered Buddhism in 1990 while living in India, and he began practicing meditation in 1993. In June 2001, he started formal monastic training, and in November 2002 he received higher ordination under the late Venerable U Silananda at the Tathagata Meditation Center in California. He has continued his Dhamma study and meditation practice for eight years under the guidance of Bhante Gunaratana at the Bhavana Society, West Virginia. 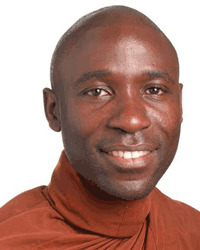 He is the founder of the Uganda Buddhist Center in Uganda and has been teaching meditation in Africa, Europe, Brazil and the U.S. Besides spending time at the Buddhist Center in Uganda, he is the founder of Bodhi Education Foundation, Inc., in Maryland. His book, Planting Dhamma Seeds: The Emergence of Buddhism on African Soil, tells the story of his religious work in Africa. View Bhante Buddharakkita's upcoming programs.